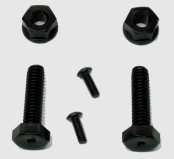 This web site contains a sample of the many manufacturers we carry as well as additional kits and parts. If you do not see what you want here, please call us to find out about our huge inventory and great prices! 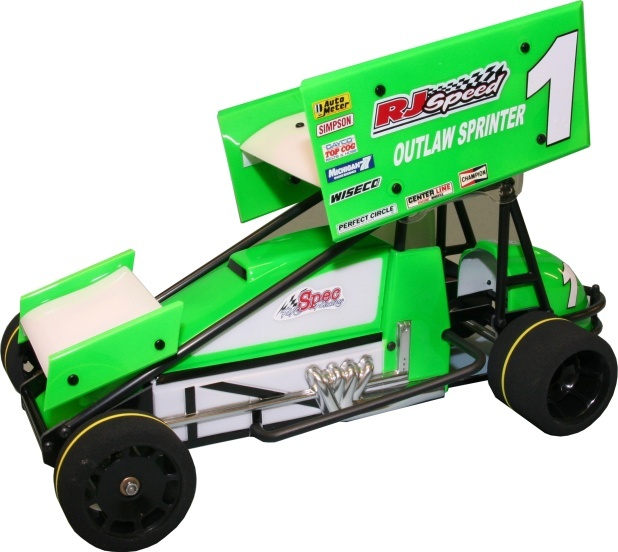 RJSpeed - Outlaw Sprinter Kit - Legends style chassis with 10" wheelbase, full molded roll cage and nerf bars. Complete less electrics. 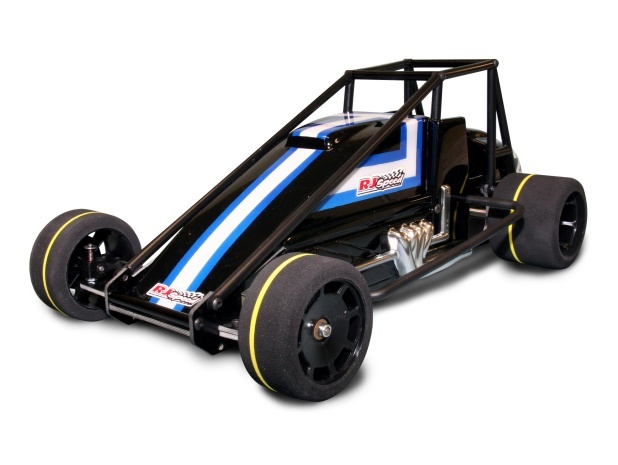 RJSpeed - Speedway Sprinter Kit - Description: Legends style chassis with 10" wheelbase, full molded roll cage and nerf bars, offset three piece front end, offset diff, and a molded four piece clear lexan sprint car body. Complete less electrics. Description: Kit less electrics includes a complete 10" wheelbase composite fiberglass chassis kit with mounted and trued tires, adjustable ball diff, gears, front spring suspension and steering linkage. 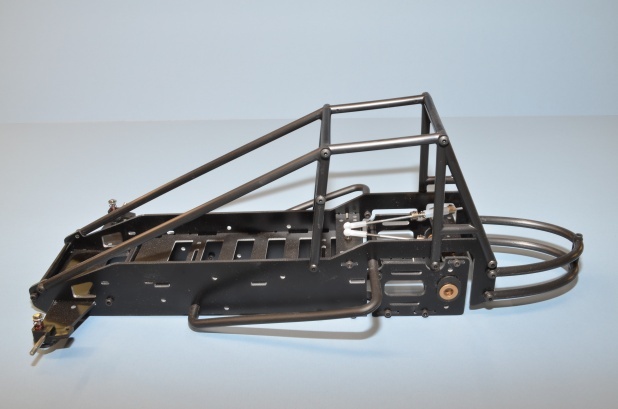 Clear Lexan Indy Roadster and Champ car bodies plus a wing kit, molded driver figures, and other detail parts allow the kit to be set up as the open cockpit model, or the roll cage style with or without a period style wing. Description: Kit less electrics includes composite fiberglass chassis kit with adjustable rear suspension, nylon roll cage, ball diff, spec times, 4pc. 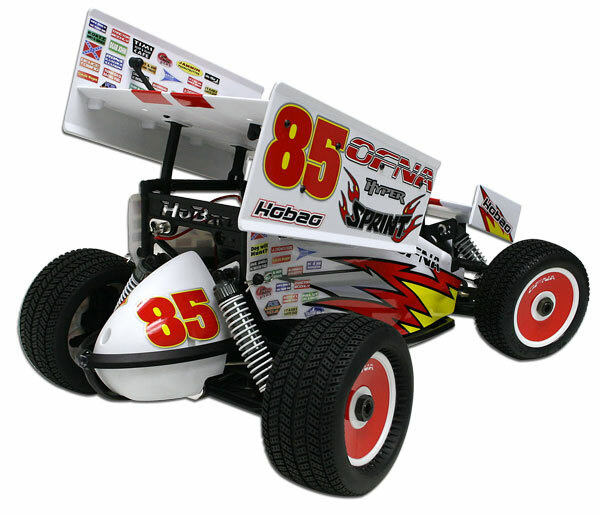 sprint car body and wing kit. This kit requires a 540 size motor, battery, 2 ch. radio with 1 servo and esc to suit the motor you choose. Use 6 cell or LIPO battery. 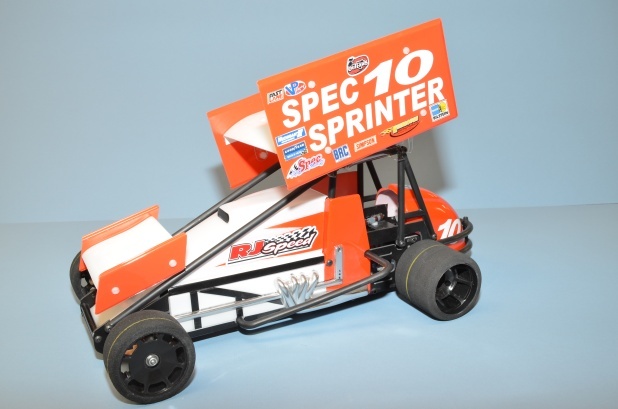 This sprint car uses Legends parts and the roll cage and body parts from our 2030 kit and has the same type rear suspension as the 2014 Spec Mod. 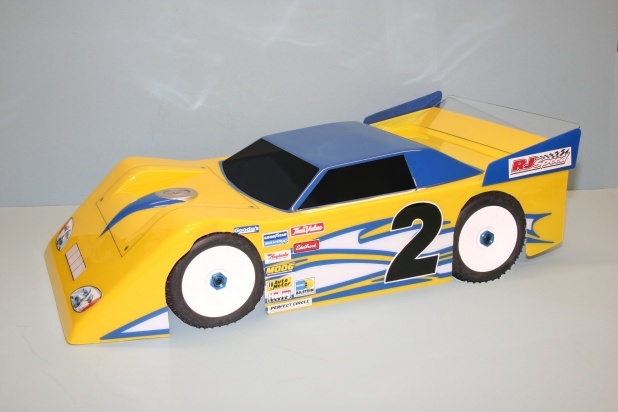 Description:1/10 scale Electric oval racing kit features composite fiberglass chassis parts with adjustable wheelbase, adjustable caster and camber, ball diff, t-plate with tweak springs, adjustable axle height, spec racing tires, gears, steering linkage and a clear 2012 stock car body with molded in rear spoiler, window masks and protective film. 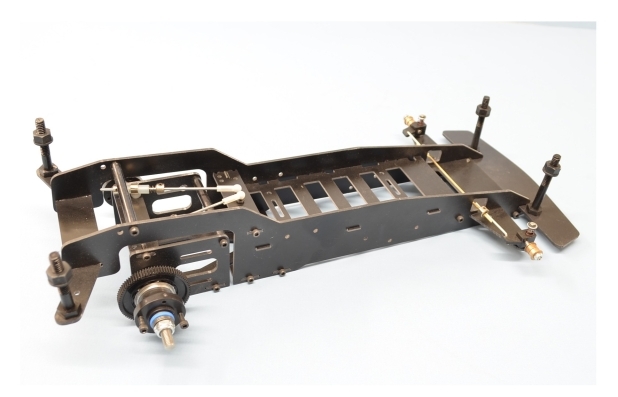 Requires 2 channel radio with 1 servo and ESC, servo saver, motor, battery, polycarbonate paint for the clear body, and assembly of the chassis parts. Specs: Length 18" (457mm), Wheelbase 10 1/4"(260mm), Width 8" (203mm), Height 4 3/4"(120mm). 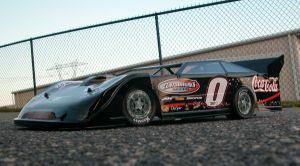 Description: 1/10TH SCALE; COMPOSITE FIBERGLASS CHASSIS KIT. IT USES A LADDER STYLE CHASSIS WITH THE ADDITION OF A SIMPLE, YET EFFECTIVE ADJUSTABLE REAR SUSPENSION. THE REAR SUSPENSION ALLOWS THE CAR TO HANDLE BETTER ON A LARGER VARIETY OF SURFACES, INCLUDING CARPET, ASPHALT, AND SMOOTH, PACKED DIRT OVALS. IT COMES LESS ELECTRICS AND INCLUDES A COMPLETE CHASSIS KIT, BALL DIFFERENTIAL, STEERING LINKAGE, TIRES, BODY MOUNTS, A CLEAR UNPAINTED BODY , AND INSTRUCTIONS FOR ASSEMBLY AND INSTALLATION OF ELECTRICS. 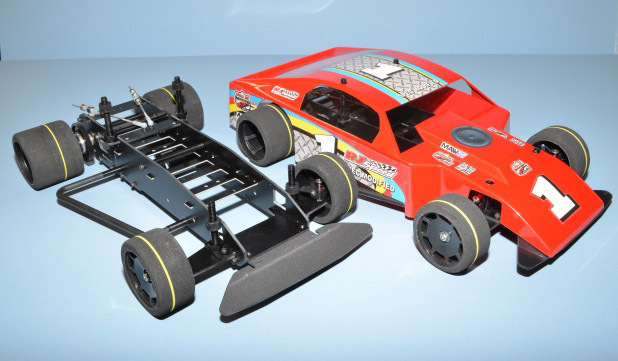 IT REQUIRES A 540 SIZE MOTOR, BATTERY, 2 CHANNEL RADIO WITH 1 SERVO, ESC,SERVO SAVER, PAINT FOR THE CLEAR BODY, MECHANICAL ASSEMBLY OF THE CHASSIS AND INSTALLATION OF THE ELECTRICS. Specs: Length 18.6 "(472mm), Wheelbase 10.2 "(260mm), Width 8"(203mm), Height 4.5"(114mm), Avg. weight ready to run 36oz. 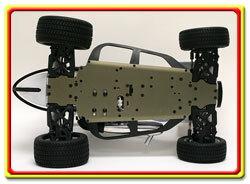 Description: Complete Spec 10 chassis kit with rear axle, diff, bumper, and body mounts. It requires a 540 or 550 size motor, 4 cell stick battery pack, and a 2 channel radio control with one servo and an ESC. Add your favorite 200mm wide body and front and rear tires. Specs: Length 15 1/2"(394mm), Wheelbase 10.1 "(256mm). 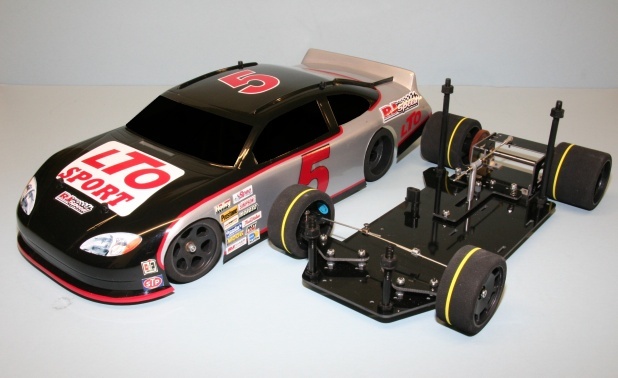 Description:OUR SPEC MODIFIED KIT IS DESIGNED TO BE A STEP UP FROM OUR POPULAR R/C LEGENDS. IT USES A SIMILAR LADDER STYLE CHASSIS WITH THE ADDITION OF A SIMPLE, YET EFFECTIVE ADJUSTABLE REAR SUSPENSION. THE REAR SUSPENSION ALLOWS THE CAR TO HANDLE BETTER ON A LARGER VARIETY OF SURFACES, INCLUDING CARPET, ASPHALT, AND SMOOTH, PACKED DIRT OVALS. IT REQUIRES A 540 SIZE MOTOR, BATTERY, 2 CHANNEL RADIO WITH 1 SERVO, ESC,SERVO SAVER, PAINT FOR THE CLEAR BODY, MECHANICAL ASSEMBLY OF THE CHASSIS AND IN-STALLATION OF THE ELECTRICS. Specs: Length 15.5"(394mm), Wheelbase 9.6"(244mm), Width 8"(203mm), Height 3.9"(99mm), Avg. weight ready to run 36oz. 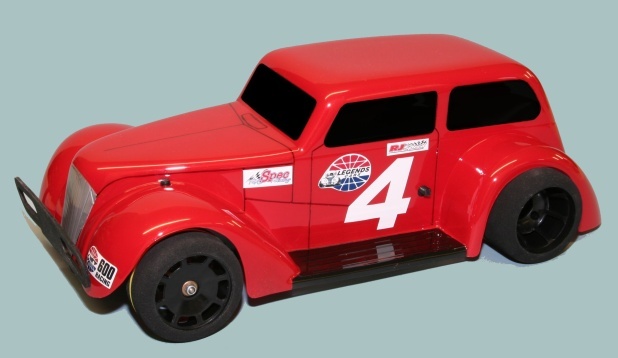 Description: THE RJ SPEED SPORTSMAN RACER IS BUILT ON A SIMILAR PLATFORM TO OUR POPULAR R/C LEGENDS SPEC CARS , USING MOST OF THE SAME PARTS, BUT WITH A 10.25 INCH WHEELBASE CHASSIS TO FIT MOST 1/10 SCALE 200MM WIDE RACE BODIES, CLASSICS AND OTHERS. ALSO NEW IS A REAR BODY MOUNT TO BETTER SUPPORT THE LARGER BODIES. 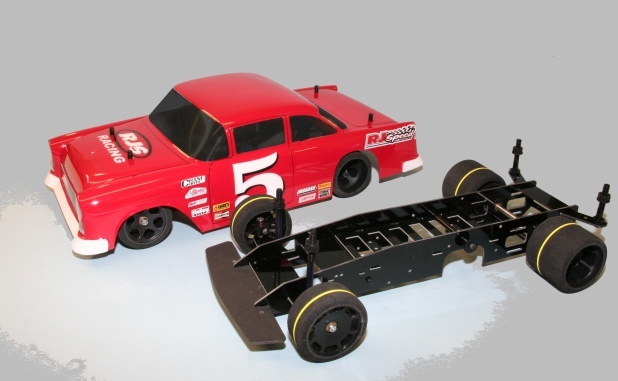 THERE IS ROOM TO MOUNT THE MOTOR IN FRONT OF OR BEHIND THE REAR AXLE AND ALSO TO MOVE YOUR BATTERY AND RADIO GEAR AROUND TO SET THE WEIGHT BALANCE AS NEEDED FOR DIFFERENT TYPES OF RACING, INCLUDING OVAL, DRAG RACING, AND JUST FUN PARKING LOT & STREET BASHING. THE KIT IS COMPLETE LESS ELECTRICS AND INCLUDES A COMPOSITE FIBERGLASS CHASSIS KIT, SPRING TYPE FRONT SUSPENSION, STAINLESS STEEL REAR AXLE WITH BALL DIFFERENTIAL, ADJUSTABLE BODY MOUNTS, FRONT BUMPER, 48 PITCH GEARS,SPEC RACING TIRES, STEERING LINKAGE, AND A CLEAR LEXAN BODY WITH WINDOW MASKS AND CLEAR LEXAN ACCESSORY ENGINE PARTS FOR BODY DETAIL. THIS KIT REQUIRES A 540 OR 550 SIZE MOTOR, 6 CELL OR LIPO BATTERY PACK, A TWO CHANNEL RADIO WITH ONE SERVO AND AN ESC TO GO WITH THE TYPE OF MOTOR YOU CHOOSE, SERVO SAVER, PAINT FOR THE BODY AND ASSEMBLY OF THE CHASSIS PARTS. 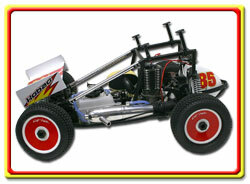 Specs: Length 18" (457mm), Wheelbase 10.25" (260mm), Width 8.25" (209mm), Height 5"(127mm). 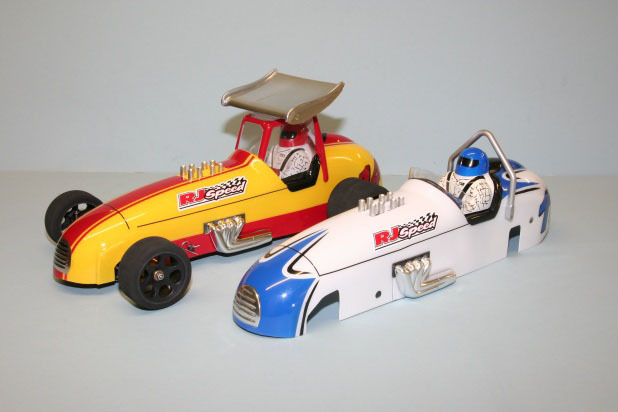 RJSpeed Legends Coupe Kit Less Electrics - CARS ARE DESIGNED TO CREATE INEXPENSIVE RACING FOR BEGINNERS AND EXPERIENCED RACERS ALIKE. THE IDEA IS TO PUT RACING BACK TO DRIVING SKILL AND CARE IN CAR SETUP RATHER THAN SPENDING MONEY FOR THE LATEST TECHNOLOGY OVER AND OVER TO GO FASTER. THESE CARS ARE PRODUCED FROM THE SAME TOOLING AS THE ORIGINAL CARS WERE IN 1994.Description:Complete unassembled kit less electrics. 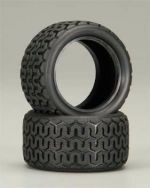 Includes all chassis parts, tires, gears, linkage, and clear Coupe body with window masks and protective film. It requires a 05 size motor, 4 cell stick battery pack, and a 2 channel radio control with one servo and an ESC. 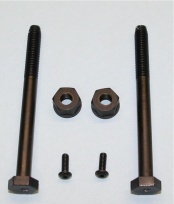 Specs: Length 15"(380mm), Wheelbase 9 3/8"(238mm), Width 8 1/2"(216mm), Height 5 1/2"(140mm), Avg. weight ready to run 34oz. 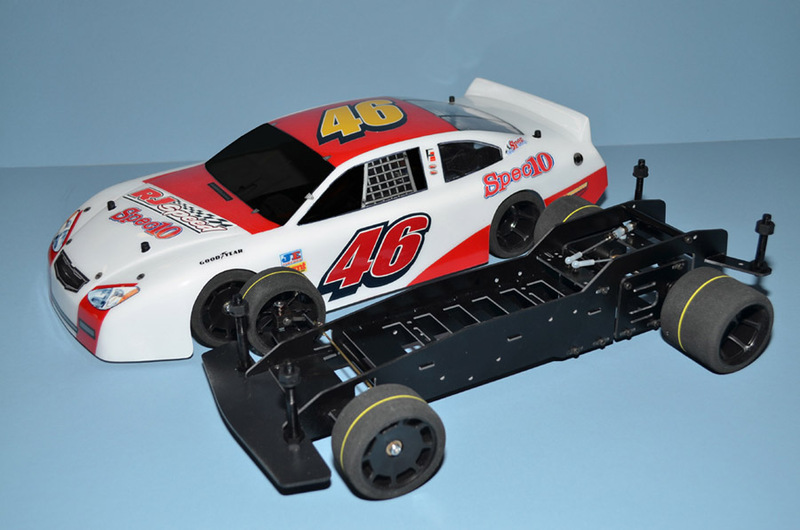 RJSpeed Legends Sedan Kit Less Electrics -CARS ARE DESIGNED TO CREATE INEXPENSIVE RACING FOR BEGINNERS AND EXPERIENCED RACERS ALIKE. THE IDEA IS TO PUT RACING BACK TO DRIVING SKILL AND CARE IN CAR SETUP RATHER THAN SPENDING MONEY FOR THE LATEST TECHNOLOGY OVER AND OVER TO GO FASTER. THESE CARS ARE PRODUCED FROM THE SAME TOOLING AS THE ORIGINAL CARS WERE IN 1994.Description:Complete unassembled kit less electrics. 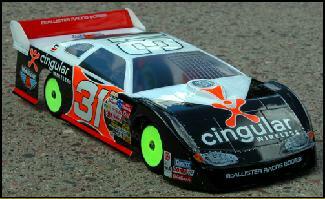 Includes all chassis parts, tires, gears, linkage, and clear sedan body with window masks and protective film. It requires a 05 size motor, 4 cell stick battery pack, and a 2 channel radio control with one servo and an ESC. Click on picture for larger image McAllister Racing: #303– 1968 FAIRLANE 500 STREET STOCK BODY. RJ Speed - ALUMINUM MOTOR PLATE FOR LTO SPORT CHASSIS (MACHINED FROM 3/32 THICK, HIGH STRENGTH ALUMINUM. MOUNTS WITH ORIGINAL HARDWARE. 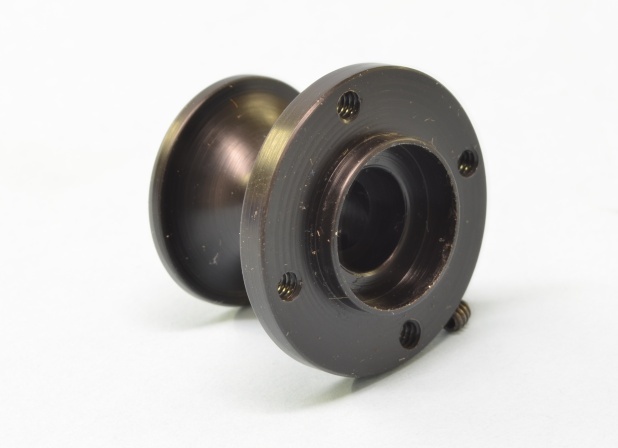 Replacing old (vintage) plastic hubs on a Bolink pan car? Use #5310 and #5311. LEFT SIDE ALUMINUM CLAMP HUB .50 WIDE. 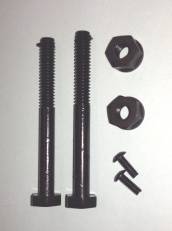 REPLACES PLASTIC OR ALUMINUM SET SCREW HUB Note - This is Just one hub! 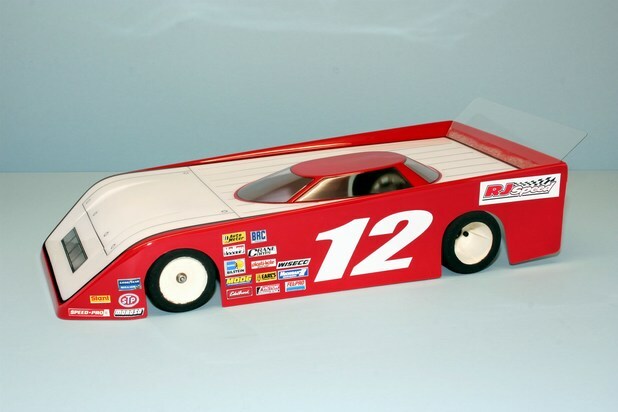 Click on picture for larger image RJ Speed : Description: Dirt Oval Wedge Body 9”(230mm) wide. Size: 24"(610mm) long x 12"(305mm) wide. . Exotic Compound - works great on carpet as well! Hard Clay Compound - works great on carpet as well! Novak - The Novak 1S LiPo Booster Module (#5477) is for single-cell racing; it replaces the receiver battery pack and will provide a constant 6 volts and 3 amps of power to the receiver and servo in your race set-up. This module connects to your main battery pack and will actually "boost" the battery pack's 3-4 volts to a standard 6 volts for the duration of the run-- which allows the receiver and servo to operate as they are intended to. There is no need for special wiring or recharging of a receiver battery pack. Simply connect the module's power wires to the main battery pack or the ESC's battery terminals, and plug the harness into your receiver's battery slot.